90% of B2B researchers who are online use search specifically to research business purchases. 71% of B2B researchers start with a generic search. B2B researchers average 12 searches prior to engaging on a brand’s site. B2B buying process influencers and decision-makers are over halfway down the path to a decision before they perform an action on your site. These statistics tell me that your prospects are doing a lot of research online about products and solutions that can address their needs. With compelling content marketing and an SEO-optimized website, your aim is for them to discover your B2B brand during that research process. In addition to getting prospects through the front door, it’s important to track them as they move toward the back door. Conversion tracking can show how many customers you acquired along with the marketing campaigns that played a part in the sale. Conversion tracking can also be used to quantify your marketing team’s performance and secure future budget approvals from the C-suite. In her presentation, Leslie shares the top five B2B conversion tracking issues, along with ways to address those issues. Instead of buying directly from the brand, many B2B customers buy from a reseller or distributor. B2B brands may have tens, hundreds, or even thousands of resellers and distributors in their channel network. In this model, prospects visit the brand’s web properties to research and evaluate its products, then venture to a reseller’s website. While there, the prospect might engage with a sales professional, obtain pricing, and ultimately purchase the product. Stage 1: Track “micro goals” or small actions that don’t yet signal strong buying interest (e.g., page views and clicks). Stage 2: Add “macro conversions,” actions that are stronger indicators of buying interest (e.g., contact form, downloads of catalogs, search for distributors). Stage 3: Assign values for each conversion to better understand which channels work best. 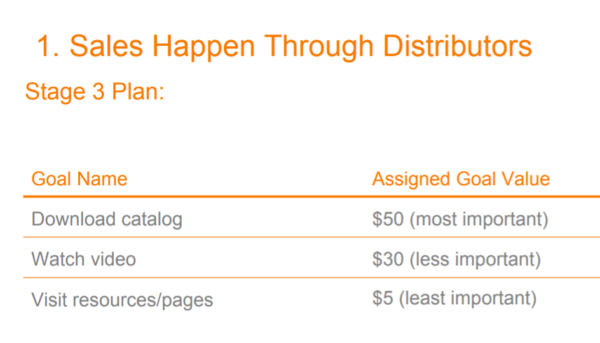 As you can see, at the first stage, the organization is relatively blind to how customers are converting (e.g., finding distributors from whom to purchase). In the third stage, the organization uses weighted values to determine which marketing channels lead to the most valuable conversions. According to Leslie, it’s important that the marketing team regularly audit the assigned goal values and determine whether they should be updated. Track distributor searches on website. Track phone calls from your website to distributors (e.g., following a “click to call” hyperlink to a distributor’s phone number). Use a marketing automation platform to track relevant or notable clicks. The “garbage-in, garbage-out” analogy can be made for conversion tracking. If your conversion goals don’t make sense or don’t connect with business goals, then conversion tracking is meaningless. The company was giving the highest goal value to a micro goal (clicks), with zero value given to the completion of an application (i.e., the most important macro conversion). These values create misleading indicators: 10 completed applications would trigger no signs of success, while 10,000 page views might signal the best month in company history. The multitude of searches created a mess. It was difficult to track conversions back to the originating search page. Finally, Leslie recommends interviewing customers so they can help validate your goals. Ask questions like “How did you find us?” and “After you found our website, what did you do next?” See if customers’ experiences match up with the goals you identified. E-commerce conversions are easy to quantify. A conversion is a completed sale. The value of the conversion is the total sale amount. In a B2B transaction, where numerous conversions lead to a sale, it can be challenging to assign values to each conversion (e.g., goal). In other words, if 2% of video views result in a $500 sale, then the value of each view is $500 multiplied by 0.02, or $10. According to Leslie, “The reason to assign values to goals is to be able to evaluate marketing campaigns and channels.” She recommends evaluating goal values periodically to ensure that they correctly represent customers’ paths to conversion. In the example of video views, the goal values need to be adjusted if the key assumptions change (e.g., average order value and conversion rate from video view to completed sale). Another scenario that can complicate conversion tracking is when a blogging or content marketing platform hosts your content on a subdomain (e.g., your website is example.com, while your blog is at blog.example.com). Once complete, conversion reporting in Google Analytics will group the external sites with your own, giving you more reliable source attribution. Rather than direct and referral, you now see the true channel or program responsible for conversions. Leslie gives the example of a B2B e-commerce company that inadvertently tracked conversions in both Google Ads and Google Analytics. The result? Its return on advertising spend was reported as $13 when it was $7.50. To fix this, confirm that double tracking is happening. Compare the numbers from your ad platform (e.g., Google Ads) and your analytics platform (e.g., Google Analytics). If you’re not familiar with this, work with an agency or someone who is an expert to let you know if the problem exists. Once double tracking is confirmed, keep the tracking on your preferred source, and disable it on the other one. Let’s compare your marketing organization to a basketball team. You won your first five games in convincing fashion. However, the team statistician had the flu, so you didn’t record the minutes, points, rebounds, assists, and steals credited to each player. How can the coach decide on the starting lineup for the next game? How can the league decide which players to name to the all-star team? They can’t, because there’s no data to inform them about the players’ performance. This is what it can be like for a B2B marketing organization that runs without effective conversion tracking. 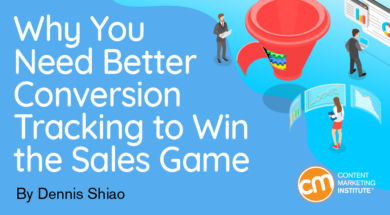 Sales happened, but the marketing team doesn’t have the conversion data to set up for future success – to evaluate marketing efficiency, to maximize spending, and to improve profits. Before hurrying off to generate the next 100 leads for your sales team, get your conversion tracking in order. The former may keep the sales team happy this month, but the latter makes the entire organization successful over the long term. How would you rate the effectiveness of your conversion tracking and where does it need to improve? Share your thoughts in the comments. Convert your continuing education plan into action. Register today for ContentTECH Summit in April. Use code BLOG100 to save $100.